Announcement All of our jewelry is designed to be Modern and Minimal making it perfect for any occasion. Most pieces are available in a verity of natural metals making it easy to mix and match with other jewelry. Each piece of the jewelry is completely handmade per order making each piece unique. Be sure to find us on Facebook and Pinterest too! All of our jewelry is designed to be Modern and Minimal making it perfect for any occasion. Most pieces are available in a verity of natural metals making it easy to mix and match with other jewelry. Each piece of the jewelry is completely handmade per order making each piece unique. New sparkly silver heart studs! Only two days to take advantage of our Etsy shop Sale - Now thru Cyber Monday. check out http://Candicevostrejs.com for 20% off your entire Purchase now - December 31, 2018. Use code WINTER2019 at checkout. + Free shipping on both shops! I discovered metalsmithing in 2006 just by chance. During my (should have been) last semester of school I needed an extra class to fill in my schedule and metalsmithing fit in so I signed up. I ended up loving it so much I changed my emphasis and spent two more years learning metalsmithing. I graduated in 2009 with a BFA in Metalsmithing. Using traditional Metalsmithing techniques I create each piece is individually from start to finish allowing each piece to be unique. Every piece starts out as wire and sheet metal and is cut, formed, textured, soldered and finished by hand. Inspiration for my pieces is a combination of minimalist and modern combined with the beautiful and decorative style of art nouveau. My pieces are designed to be beautiful and feminine but simple enough for everyday. Find me on Facebook or Pinterst to get updates on shop sales and coupon codes. All of the jewelry in my shop is handmade from start to finish by myself using traditional metalsmithing techniques. Most pieces are made to order so please allow up to 7 BUSINESS days before shipping. Please send me a convo if you need a piece sooner or by a certain date and I can usually work that out. Earrings are Non-Returnable items due to hygienic safety. Metal will tarnish. I fully explain this in each listing and I will not take a return on earrings because of tarnishing. This is normal. I cannot guarantee any earrings to be hypoallergenic and will not take returns on earrings because of a metal allergy/sensitivity. If for any reason you are not happy with your purchase please let me know within 7 days or receiving your item. I do except returns minus the shipping on jewelry that is unworn with the exception of earrings. Items must be returned within 14 days of receiving, in new/unworn condition in the box. Seller reserves the right to refuse any product that is suspect to being worn. All U.S. orders ship free with first-class shipping. Shipping upgrades are available at checkout. Everything is made to order so please allow up to 7 BUSINESS days before shipping. The estimated shipping time is for first-class is 2-5 days (once shipped) but not guaranteed. International Orders- I also use USPS first class. The shipping times vary, and may take 2-8 weeks. International buyers: Some countries may charge VAT and/or customs and/or additional charges on imported items. These additional charges are not included in my listing prices and are the responsibility of the buyer. All items will be marked as merchandise and valued at the actual purchase price on customs forms. Patina may or may not be desirable depending on your preference. To prevent jewelry from tarnishing avoid wearing your jewelry in the shower/swimming. When you are not wearing a piece keep them in a sealed plastic bag to keep air from getting to them. Cleaning your jewelry often will also help (especially earrings!) Cleaning your earrings with just soap and water is fine. Make sure to dry them. To clean tarnish from a piece I recommend using the “sunshine” cloth included with most orders. Pieces with a brushed finish can also be cleaned with any abrasive type cleaner (like bar keepers friend) and a scrubby or toothbrush. For polished finishes any type of liquid metal/jewelry cleaner and a cloth should work. Patina is only a surface treatment. It is sealed with a wax sealer, but over time it is possible for it to fade, usually on areas that are against the skin. If your patina starts to look dull, a tiny amount vaseline can be rubbed with a cloth or paper towel and will make the color appear darker. *Do not use the sunshine cloth or anything abrasive on pieces with patina. 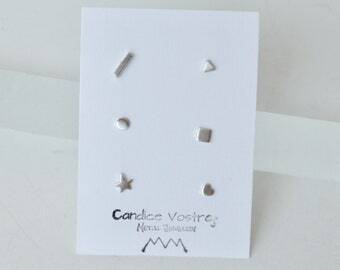 As the owner of CandiceVostrejs Metal Jewelry, I have access to limited personal data for essential business purposes only. When you place an order in my shop, I receive your name, delivery address and email address from Etsy. I will only ever use this information to process and deliver your order, or deal with any queries you have related to that order. If you send me a message using the Contact link on Etsy, I will receive your username. I do not use or pass on your personal information to third parties for marketing purposes or any other purpose. Most things are made to order, so please allow up to 7 BUSINESS days before shipping. The estimated shipping time is 3-5 days (once shipped) but not guaranteed. Shipping upgrades are also available at checkout. International Orders- The shipping times vary, and can take between 2-8 weeks. Any customs fees are the buyers responsibility. I do not guarantee anything to be hypoallergenic as everyone is different and what works fine for one person may not for the next. It is the buyers responsibility to know if they have any sensitivities to certain metals. I will not take returns on earrings because of a metal allergy/sensitivity. 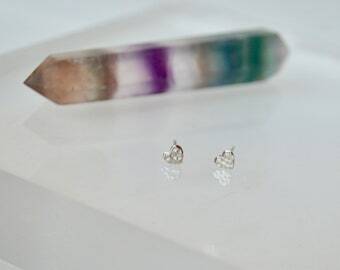 Earrings are non-refundable/exchangeable items due to health and safety considerations. No. Silver, Copper and Brass all will tarnish! This is totally normal. Most orders will come with a polishing cloth to clean away tarnish. I do not take returns on earrings due to tarnishing. Why different post lengths? Its really all personal preference, everyone is different.. Some people don't like their earrings too tight, others don't want a ton of excess post sticking out. If you're not sure measuring a pair you currently own is best. In general, 7/16" is usually a good size for most people. 1/2" is more of an oversized post for people that find a lot of earrings too tight and 3/8" works well for piercings where you don't want a lot of excess post sticking out, like along the top of the ear, although it can work for regular lobe piercings for some people.